Blanche of Castile (1188-1252) may be, historically speaking, mostly remembered as the mother of Louis IX and as Queen of France, and not many women can top that really. Her role, however, does not stop at being one of the most powerful women of her time, for, artistically speaking, she is often linked to what is generally known as the Psalter of Blanche of Castile, an exquisite Gothic example of Parisian book illumination. She is believed to be the recipient of such masterpiece, which explains the name by which the manuscript is generally known. Unfortunately, there are still many doubts on whether she was the actual recipient of the codex and we’ll see in a second why she was associated to it. First, let me give you a bit of data about the manuscript, also known as the Sainte-Chapelle Psalter: it was created in the first quarter of the 13th century, it features 27 beautifully illuminated full-page miniatures, 9 historiated initials and 24 calendar medallions, and it was preserved in the treasury of the Sainte-Chapelle since 1335 until the 18th century, hence its other title. Back to Blanche. In the course of the years, many identifications have been proposed but most scholars seem to agree on the figure Blanche of Castile. Why? Well, this results from the interpretation of f. 122v featuring a kneeling lady in front of the altar. The figure, uncrowned, has been interpreted as a depiction of a praying Blanche, uncrowned because she ascended the throne in 1223, after the psalter was finished. 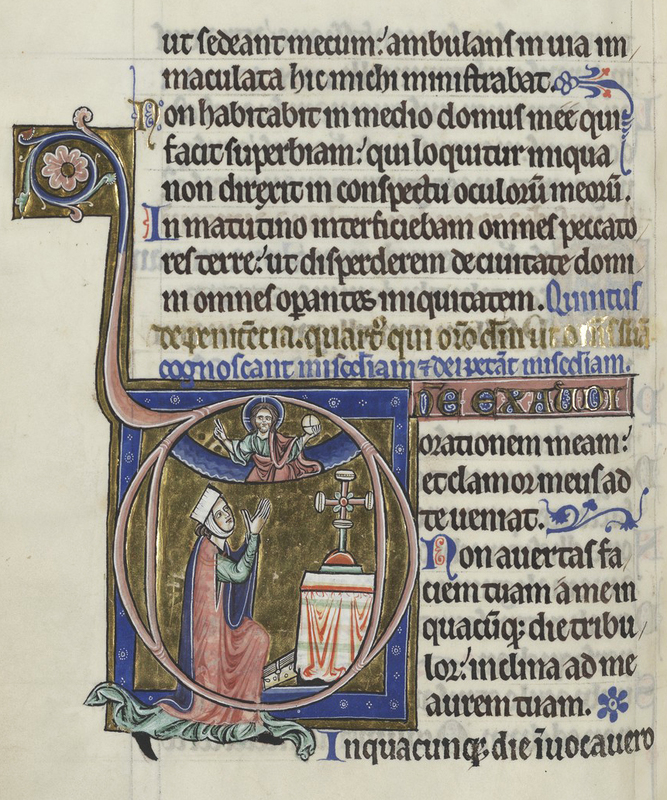 A couple of other features support the idea that, if not for Blanche herself, the psalter was made, at the very least, for a noble woman – proved by the opulent use of gold and the title in a prayer on f. 190r featuring the words miserrimam peccatricem (the most miserable sinner). Did you know that the manuscript ended up in the collection of Charles V? It appears that the emperor had a chemise – splendid fabric embroidered with golden flour de lys – made, to protect the manuscript. As a result, the cover is one of the few testimonies of Roman book binding still preserved today!